Ask any gutter installation company how to get the most out of your gutters and make sure they have a long, useful life, and you will undoubtedly be given some very important gutter cleaning tips. Maintaining a clean gutter doesn’t just look better, it functions better, and that, at the end of the day, is what you want: a highly functional gutter that is effectively channelling water and debris away from your roof and home. Below are four tips for properly cleaning gutters. The first thing a responsible gutter installation company should tell you is to ensure you understand ladder safety. It is typically not advisable to use a wooden ladder because they can be unstable, you should ensure you have the proper ladder for the job. People have accidents cleaning gutters, and one way to keep yourself safe is to understand your ladder and how it works, and, when possible, have someone assisting you at the bottom. A gutter installation company will be intimately familiar with gutter scoops, and you should pick one up for yourself if you plan on keeping your gutters nice and clean throughout the year. 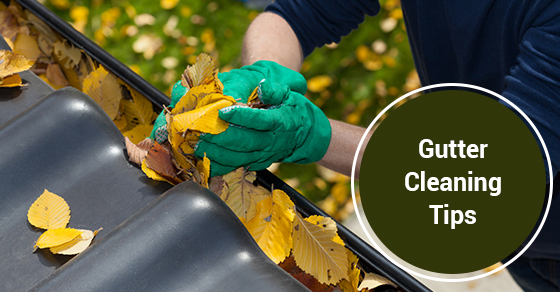 A plastic scooping tool can help you quickly remove leaves and dirt from your gutters. Make sure it is plastic, however, as a metal tool can end up damaging your gutters and mean future repair costs for you. Anytime you are working outdoors you should wear gloves, but this is especially so with cleaning gutters, because the things that can become trapped in your gutters often contain a lot of bacteria. This includes dead insects and other pests, their droppings, dirt, rotting leaves, etc. Small shards of metal and rust can also be a hazard to worry about while cleaning gutters, so it is a good idea to get some durable waterproof gloves that are going to keep your hands safe and sound while you are cleaning. A lot of what accumulates in your gutter is debris that has fallen directly off your roof into the gutter. If you have a bunch of debris lying on the area of your roof surrounding the gutters, and you don’t clear it away first, it will make its way into the gutter at some point in the future, defeating the purpose of cleaning it in the first place. A pressure washer, or a soft broom with a long handle, is usually up to the task. Gutter installation is something you are investing your hard earned money in, so you are going to want to maintain that investment by keeping your gutters clean. Keep the above gutter cleaning tips and advice in mind, and make sure you are cleaning your gutters the right way, keeping yourself safe in the process, so your gutters stay up and running for years to come.